We all love a comeback story, but are the Jets on the right path? 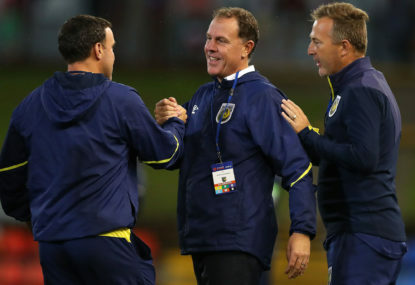 Newcastle’s four-game winless streak extended to five when they were beaten 1-0 by Sydney FC three games ago, but despite slumbering in the bottom four on the table and failing to reduce the deficit on the bottom spots of the top six occupied currently by Adelaide United, Melbourne City and Wellington Phoenix, coach Ernie Merrick was adamant his side would play finals this season. “We’ll definitely make top six. I think that can be done,” Merrick said, confirming his side’s lofty ambitions. Why would Melbourne City re-sign Warren Joyce? 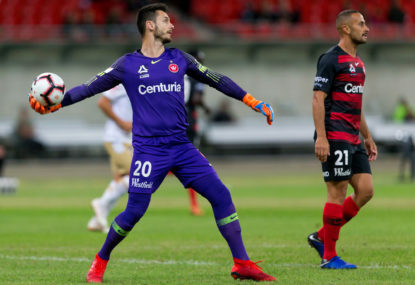 The Jets have since recorded two wins and a loss, the most recent a 5-1 drubbing of a lacklustre Western Sydney Wanderers outfit at ANZ Stadium. The slippery contest on Friday night epitomised everything we grew to learn of the Jets last season – a campaign that saw them reach their first A-League grand final since claiming the championship in 2007-08. The Wanderers weren’t without their chances early in the game, Glenn Moss proving to be their only obstacle. But once fan favourite Dimi Petratos broke the shackles with a habitual blistering strike, the Wanderers were bullied by a Jets onslaught. Jason Hoffman made it two, before their first penalty of the season – much to the delight of Merrick – was capitalised on the follow up by striker Roy O’Donovan. The 3-0 half time lead was cherishable for Jets fans who hadn’t seen their side play with such accuracy all season despite leading the league in chances created. 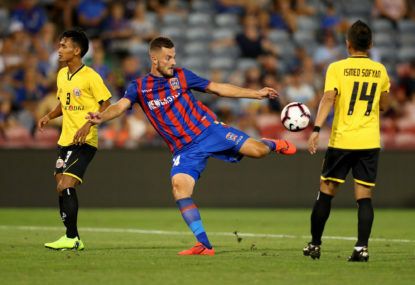 O’Donovan and Matthew Ridenton added two more in the second half of a game that could prove to be the launchpad that inspires the Jets into their six-point Thursday night clash against the Wellington Phoenix and beyond. The Round 17 performance was one that mirrored last season’s offensive style that was feared by most teams in the competition. 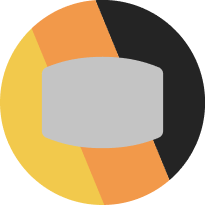 Their problems – wasting chances – have been evident all season long, ranking tenth in the league for overall conversion rate. But was it a surprising result? The Jets have made 290 shots on goal this season, more than any other team in the league. Compare this to teams like Melbourne Victory (219 shots), Sydney FC (201 with a game in hand) and Perth Glory (192), who all boast incredible firepower up front, and all of a sudden a late surge into finals contention is certainly not off the cards. The Jets have also conceded only two more goals than last year’s champions Victory, who have been dubbed by many in the A-League sphere as the best team this season. “We’d been threatening to score a number of goals, we’ve been getting into that front third, we’ve had more opportunities and shots than every other team in the league and today it went well for us,” Merrick told reporters following Friday night’s morale-boosting triumph. “I think the players were really impressed with that result, we were exhausted at the end, as I said we’ve played six games and only one at home so the boys are pretty tired. “We’ve got another game on Thursday night but I think they’ll feel a lot better in themselves and their belief. “We’ve had more shots and created more opportunities than anyone else. “We thought we could catch them in behind with early crosses and through balls, and that’s what worked for us. “They’ll feel a lot better with that performance. People have said that Ronny (Vargas) and Dimi (Petratos) can’t play in the same team but of course they can, it’s all about finishing. Newcastle, through Petratos, O’Donovan, Vargas and Hoffman, is the only team in the league that has four players inside the top 15 for total shots at goal this season, with Petratos leading the way with 71. O’Donovan with nine matches is the only player who has played less than ten games that is in this category. 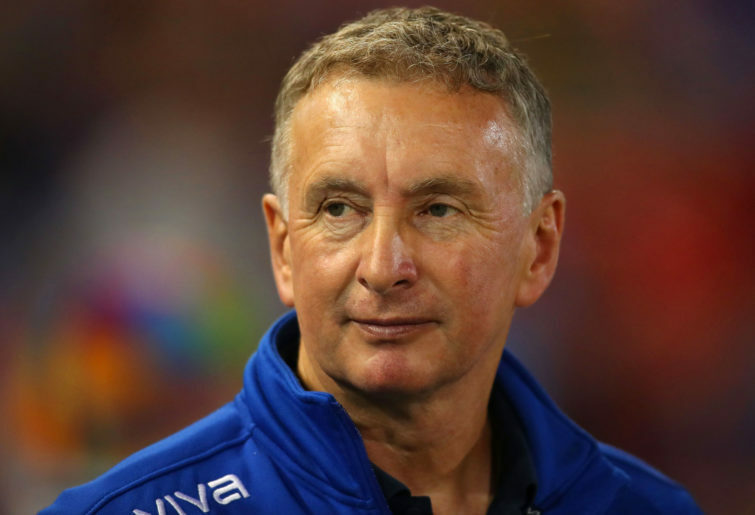 Ernie Merrick is spoilt when it comes to weapons in his arsenal, and teams will lay off against the Jets at their own peril. The gaffer admitted that his players are relishing the underdog tag after last season’s success, and there’s no doubt they’ll be looking at their three consecutive home matches to come at Hunter Stadium to send a message to the rest of the A-League. 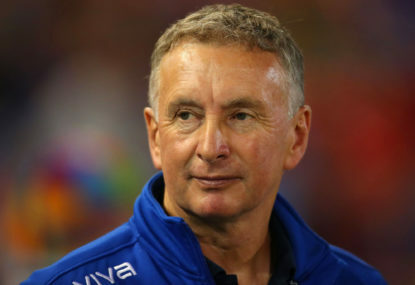 If anyone knows what happened to the Jets, can they please tell Ernie Merrick? Mondays can be particularly sobering in professional sport. 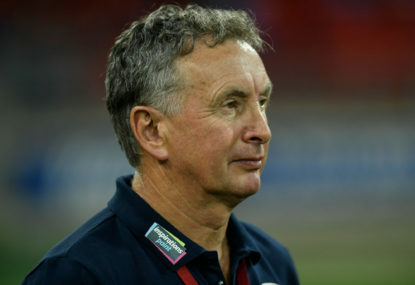 Ernie Merrick is one of the A-League’s greatest characters and managers. Kaine Sheppard - the Socceroos' unlikely striker solution? 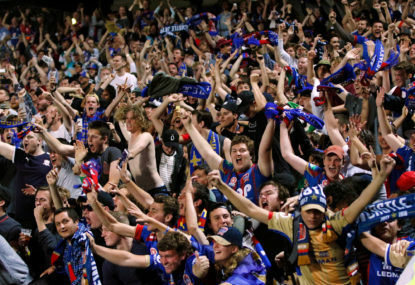 The most optimistic Newcastle Jets fans would have been looking for a demolition job over the Central Coast Mariners after the Mariners’ embarrassing 8-2 defeat against the ‘Nix. This 30-something bloke had lost it. We’d got him. The Squadron Newcastle fans had tried his patience to the point where his blood was boiling and he just couldn’t take it anymore. His body was rigid, his right arm outstretched, finger jabbing wildly in the direction of the baying Squadron. Goalkeepers are possibly the most important part of a football team, but how good are the A-League’s keepers?